This monitor riser helps reduce shoulder, neck, and eye strain by positioning monitor or laptop at a comfortable viewing angle. The adjustable feet optimize monitor height positioning . Unique stacking columns raise design offer the most comfortable viewing level. Sturdy plastic construction to support most LED/LCD monitors up to 24". Non-skid rubber feet for stability with the cable manager. Platform size 13.20" x 13.5". 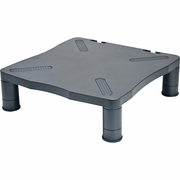 Enjoy the comforts and benefits that this monitor riser can offer. Correctly positioning your monitor the correct height and focal distance is a key factor in your ergonomic health. This monitor riser for the desktop helps put your monitor at a comfortable viewing level.Raising monitors up to 24" in size up 4" above the desk surface, it is made of sturdy plastic.